VW Beetle Prequel – “The Bark Side” featuring an amazing chorus of dogs barking out the Imperial March (Darth Vader’s Theme Song) from Star Wars. John Williams is probably laughing and cashing the check with earplugs firmly in place. Honda CR-V – “Matthew’s Day Off” in which Matthew Broderick reprises his immortal role from 1986’s Ferris Bueller’s Day Off. The all-new Toyota Camry is so important to Toyota’s recovery after a disastrous 2011 that it earns itself two excellent commercials. “It’s Reinvented” is decidedly un-homophobic and refreshing while “Connections” tugs at the heart strings. Toyota wants to steal Chevy’s theme, “Chevy Runs Deep” and “Connections” is as close as it gets to remind Generations X and Y that they grew up with 7 million Camrys and it’s part of their DNA. Volkswagen is back with two great ads for the 2012 Beetle (just don’t call it the “New Beetle”). “The Dog Strikes Back” takes doggie aerobics to a new level with a tinge of Darth Vader while its prequel, “The Bark Side” needs a few seconds to warm up before you catch the tune. I love the new Chevy Sonic “Stunt Action” spot not just for its amazing stunts but for its use of the infectious anthem to youth, “We Are Young.” It targets more than 70 million Generation Y/The Boomerang Generation/The Millennial Generation (~1982 – 2000) that automakers so desperately are courting. The song sort of burst out from nowhere on the December 7, 2011 episode of Glee, as the song was used to end the episode in anthem form. The YouTube clip has been viewed more than 4.6 million times. Since GM/Chevrolet is a big sponsor of Glee, the tie in makes perfect sense. The Sonic commercial uses the original song from an album to be released on February 21, 2012 by the previously-obscure group, Fun. Chrysler had to come up with a follow up to last year’s sensational “Born Of Fire” feel-good, edgy ode to the Motor City featuring hometown rap superstar Eminem. That didn’t happen. I’m a big Eastwood fan – both his acting and directing – and I liked his gritty, aged voice that called for unity and moving forward. In his simple, beautiful, powerful 2008 film Gran Torin, Mr. Eastwood played a retired Ford auto worker who felt out of place in his hometown, Detroit, once the center and symbol of America’s industrial worldwide dominance. He not only directed himself, but wrote the music for this tragic and touching story. The haters are already filling the blogs with disdain and jeers; but I’m in the mood to be sentimental about the vital importance of a domestic auto industry with good, middle-class wages and benefits. It may not last, but I’ll hang on to that fantasy for a little bit longer. Chevrolet Volt: Aliens 2 – Who told? CODA Automotive, Inc. is a Santa Monica-based start-up company that has the lofty goal of putting an “electric car in every garage in the world.” While the eventual electrification of the automobile is inevitable, it’s going to be a while before that happens – probably at least a few decades. To get there, we’ll need a global shift in personal transportation thinking as well as vast improvements to the electrical grids and charging infrastructure. 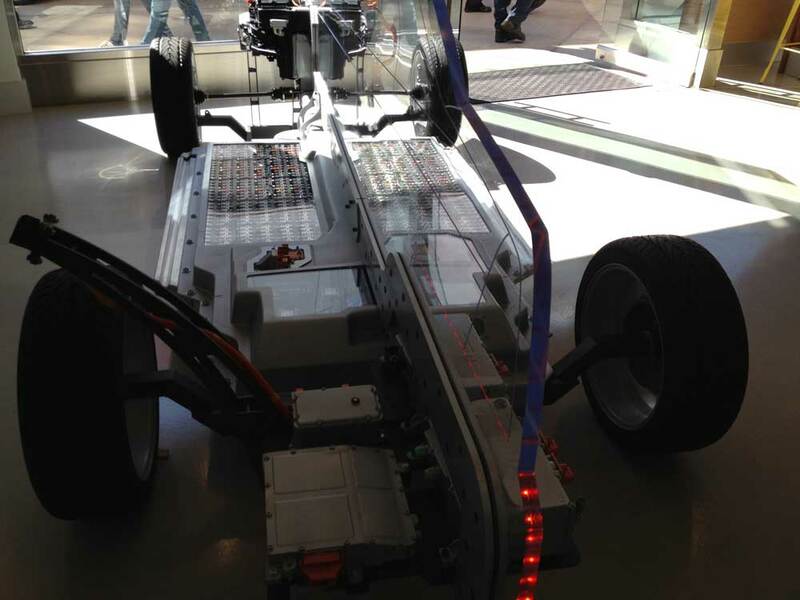 The future of the electric car depends on battery technology. Currently, batteries (1) are too expensive, (2) weigh too much (weight is the enemy to efficiency), (3) lack sufficient energy storage capacity for long-range driving and (4) don’t recharge as fast as our fast-paced lifestyles demand. You probably haven’t heard of CODA unless you’re an automotive tech geek or you’ve been to the Westfield Century City shopping mall near the AMC Cinemas and stumbled upon the CODA Experience Center, the company’s first, very slick showroom stocked with a see-through chassis and well-groomed, uniformly-dressed, ever-helpful 20-somethings called “Gurus” on their business cards. 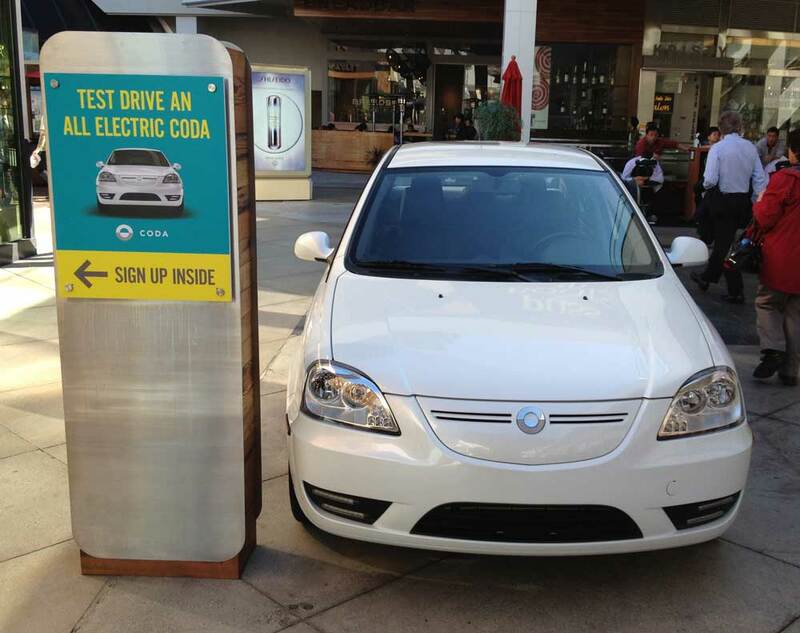 CODA thinks its proprietary battery has solved most of the common complaints about an electric vehicle. The CODA 1.0 Sedan (yeah, that’s really its name) claims a 150 mile range — much better than the claimed 100 miles for the Nissan Leaf and double or triple the EV-only range of the Chevy Volt. For CODA’s large capacity 36 kWh 728 cell 330V battery, engineers chose Lithium Iron Phosphate (LiFePO4) chemistry rather than the more conventional lithium ion (L-i) chemistry used for batteries in the Leaf (24 kWh), the Volt (16 kWh), the $120k Tesla Roadster (56 kWh) and the Plug-In Prius (4.4 kWh). CODA believes its battery pack is more robust, longer-lasting and safer. Manufactured in China without need for rare earth elements or cobalt, it provides greater range for less money. 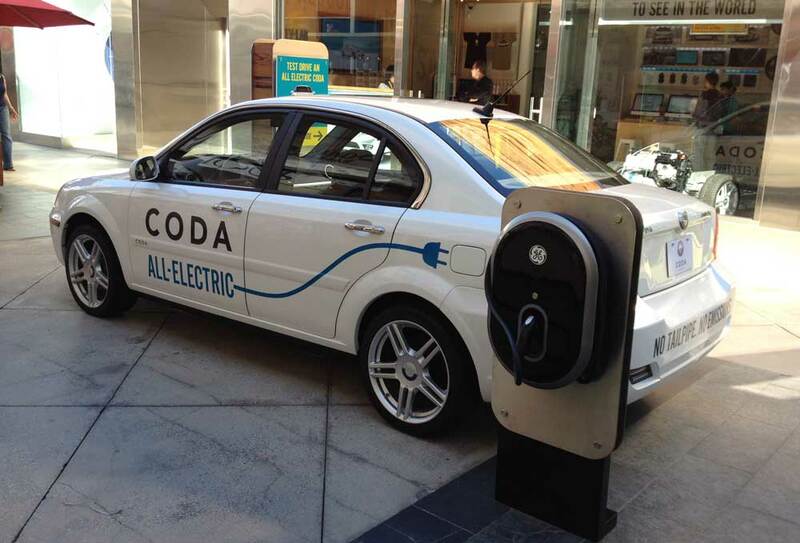 The CODA’s battery also charges faster than its competitors primarily due to an on-board 6.6 kW/240 VAC charger. By comparison, the Leaf and Volt both have 3.3 kW chargers. The CODA can absorb enough juice in 2 hours to travel 40 miles – more than most people need for a day of driving. A complete charge takes only 6 hours. The CODA's on-board charge consists of two 3.3 kW 240VAC chargers. Double the competition. 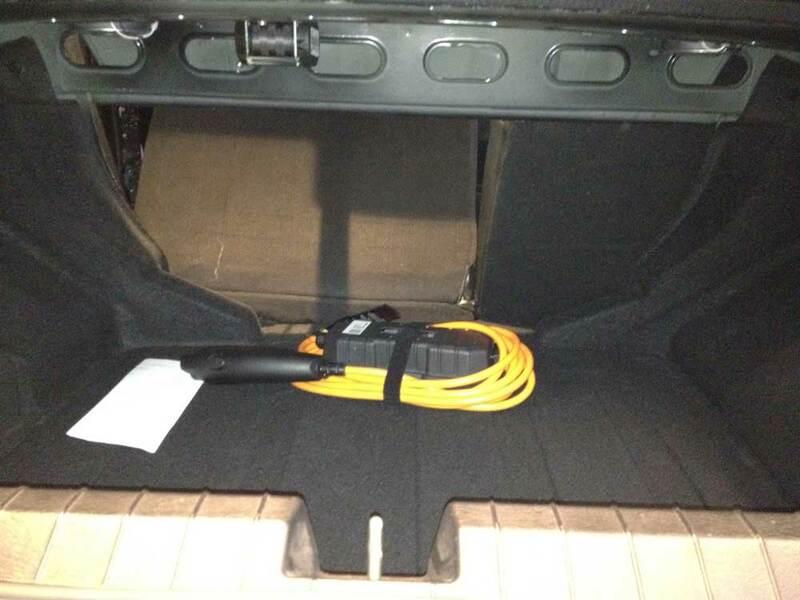 Of course, this assumes you plug the car into a 240 volt, level 2 charger at home or at a public charging station. You can plug it into a regular 110 volt, level 1 socket, however you will need 10 hours for a 50 mile charge and a whopping 30 hours for a full charge. In real world driving, the Leaf is getting 70 – 80, not the claimed 100 miles per charge. I’d expect a similar decrement for the CODA; but my lovely, knowledgeable and engaging Guru, Sophie, assured me that CODA’s battery was different and better. She was absolutely positive I could cruise out to Palm Springs (125 miles), at 70 mph, with air conditioning and radio blasting, and still have extra range on arrival. My "guru" Sophie Nenner from the Century City store. She was absolutely delightful and could answer any question I threw at her. If you're interested, you can contact Sophie for a test drive. 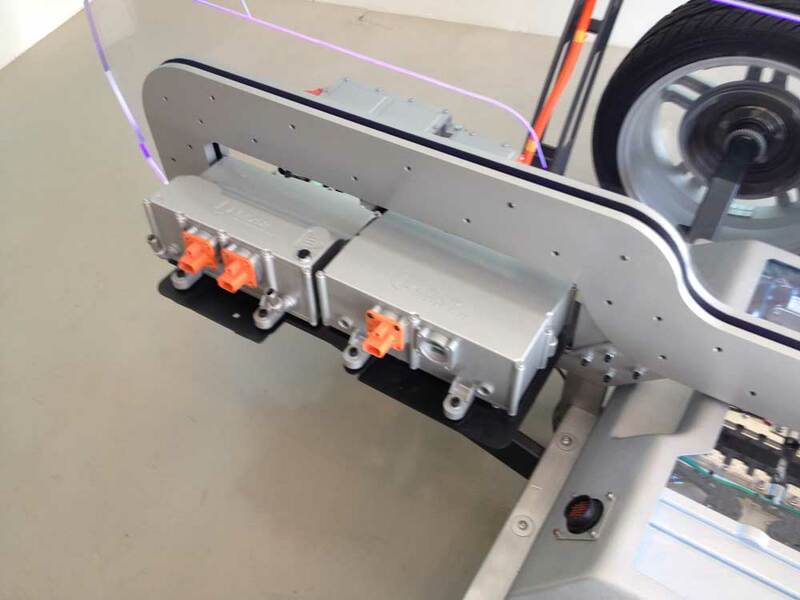 The battery pack and battery management hardware lie flat in the chassis, between the rear wheels and front axle, giving the CODA sedan a low CG (center of gravity). CODA’s proprietary “Active Thermal Management System” keeps the battery at an even temperature whether you’re in snow or sizzling in the desert. Engineers claim the CODA 1.0 Sedan handles like a sports car because of the even weight distribution, low CG and 221 lb-ft of torque that is available from zero with the 100 kw/134 hp UQM Technologies motor attached to a single-speed Borg Warner transmission. A sports car it’s not, but it is a credible commuter car. So far, all I’ve talked about is the battery. CODA’s own literature says “…Around the battery, we built a car, a company and a brand.” In fact, CODA’s first car is really just a great battery in search of better clothes and accessories. I’ll start with the anonymous late 1990s exterior styling. Our friend Tom Pease was told it was an unproduced Mitsubishi design. Maybe; but it could have been any econo-box from that time period. It’s hard to get excited about the sparky stuff when the exterior is such a non-conductor. 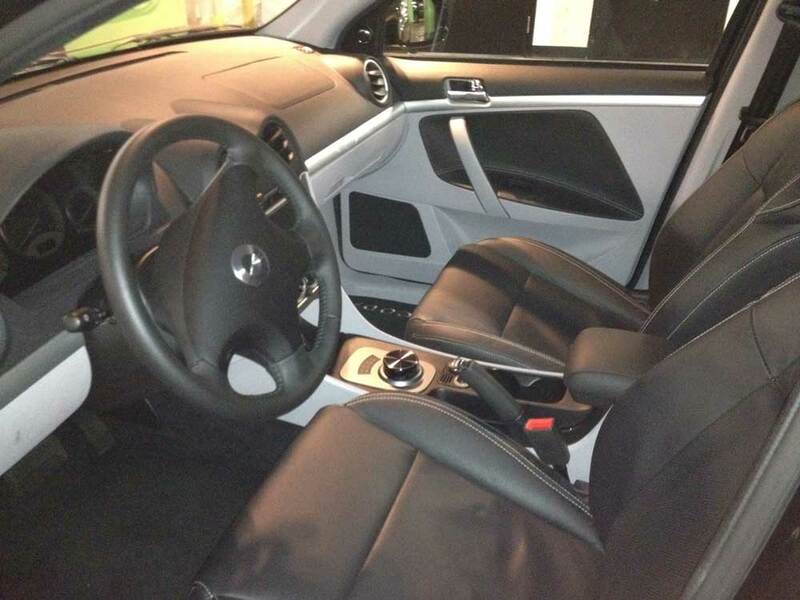 The sober and utilitarian interior is a United Nations of leftover or dated parts from Tier 1 suppliers. It all looks familiar in a generic way. You’re surrounded by two-tone imitation Apple white and dark gray hard plastic panels (the car’s one attempt at “style”), a simulated cardboard headliner, minimal instrumentation and manual HVAC controls that look like they came from a 1995 Toyota Yaris. Don’t look up – there’s no sunroof and you can’t get one. The center dash houses an Alpine navigation-infotainment system with a distinctive aftermarket look. It boasts custom software to display the essential EV diagnostics, charging station locations and the all-important real-time range calculator. It was still in beta format on my test drive so I can’t tell you how well it works, but I do know it has Bluetooth and iPod/iPhone connectivity. There is no satellite radio option. The "cockpit" of the CODA. Note the center rotary gear selector knob. This ain't no Jag. 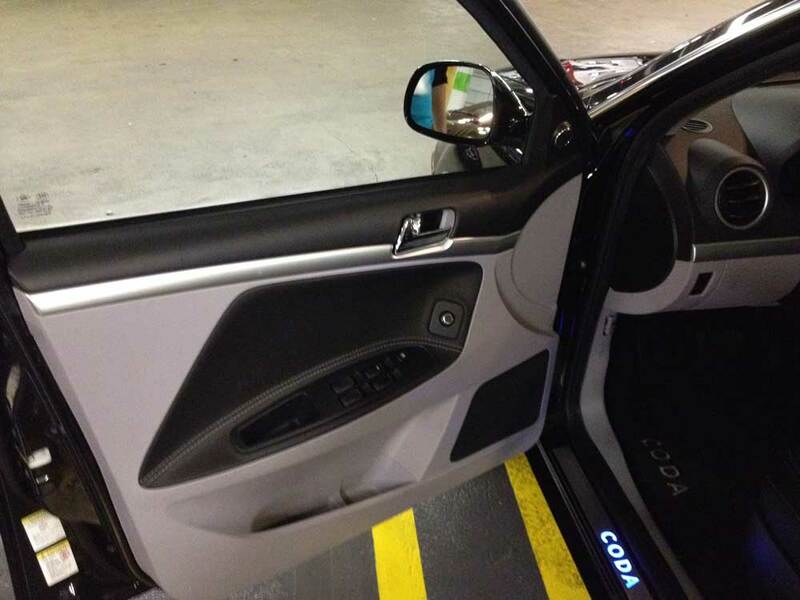 The driver's door of the CODA. The two-tone theme was its the only attempt at "style." The CODA’s center-mounted cylindrical gear selector looked and felt cheap. I thought it twisted too fast without easily discernible notches or stops. Is that Park or Reverse? Oops, I dinged the rear bumper on a concrete bollard in the subterranean garage. You start the little sedan with an old-school key – no new-flanged push button start here. Except for the infotainment system, this car felt like a stripped, 15 year old Korean subcompact. 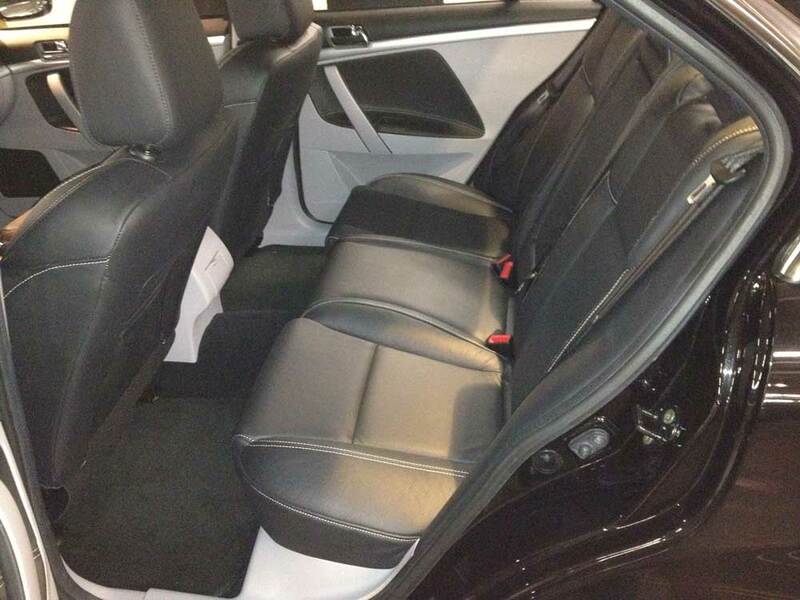 The only option package available was the $1,495 leather seating surfaces and “premium” (better speakers) audio system. My pre-production tester had the aforementioned “premium” package. I wondered if the hard, flat French-stitched leather seats were worse than the cheap cloth “standard” seats. In either trim, only the driver’s seat gets a rake adjustment and my 6’1” frame wished for more thigh and lateral support. I wasn’t in the car long enough to judge the seat’s long-term virtues; but I’m a bit skeptical. If you have back seat passengers, they need to be short, thin and distracted. The center fifth seat should only be used to coerce confessions. At least the 60/40 split folding seats offer extra cargo flexibility. The folding rear seats do allow for some extra cargo capacity. Maybe it would work for skiis or a long narrow package from IKEA. Emerging from the underground parking structure, I was immediately struck by the road noise – something much more pronounced on silent EVs. Your next sensation will be a moment of panic when you hit the hyper-sensitive, spongy regenerative brakes. There’s no assured linear feel here. It makes you long for the grabby brakes on a Prius. On the plus side, acceleration was brisk and fun and the car felt solid and rattle free. The electric power steering isn’t going to win awards, but I felt in control even if there was little road feedback. While the car is a tad heavy at 3,670 lbs, the well-distributed weight didn’t seem to get in the way. Overall, while it was a fun drive, the CODA lacked the creature comforts, advanced features, modern styling and unified design of its rivals from well-established manufacturers with vast dealer networks. The CODA’s trump card is its extended-range, fast-charging battery. The CODA’s base MSRP of $45,795 is expensive. 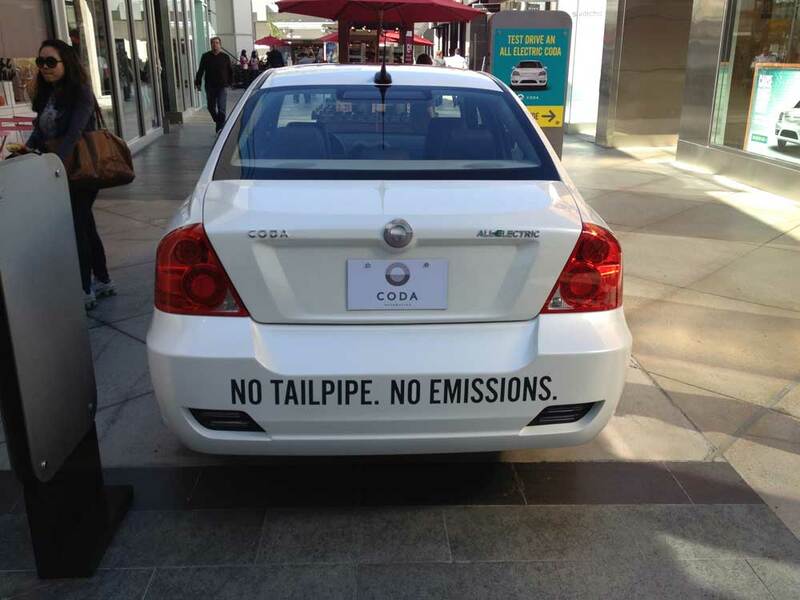 After the $7,500 federal tax credit and the $2,500 California BEV incentive, the price comes down to $35,795. But that’s thousands more (after credits and incentives) than a fully-loaded Volt ($33,135) or Leaf ($27,250) and about the same as the new Plug-in Prius Advanced ($35,525). So what’s a battery with four wheels worth? CODA gives zero emissions customers the tantalizing promise of extended range, fast charging and an entertaining powertrain. For the target customer – early adopters, tech-geek and eco-freaks – the uninspired, low-rent packaging may short-circuit enthusiasm for this ambitious little car.